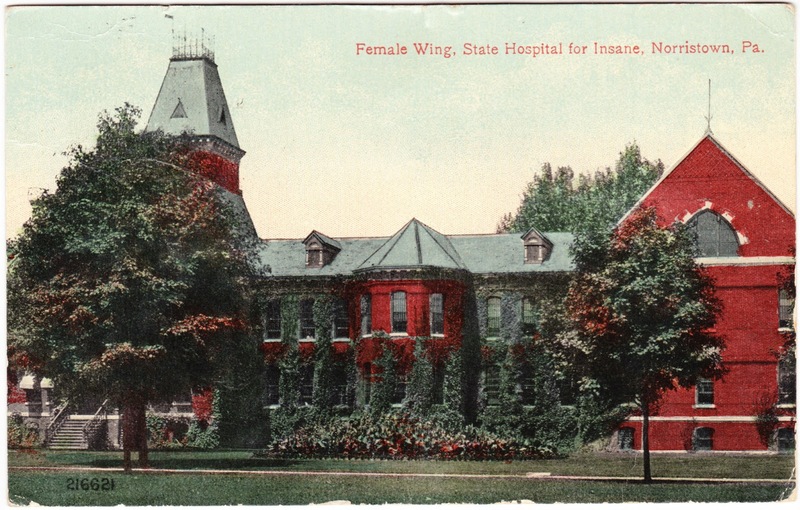 This postcard shows the "Female Wing, State Hospital for Insane" in Norristown, Pennsylvania. Was it written and mailed by a patient there back in 1916? Quite possibly, in my opinion. 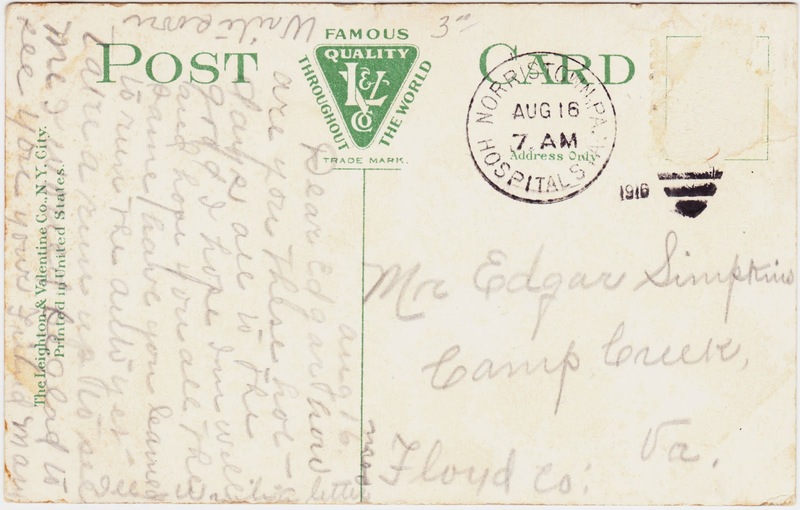 It was postmarked at 7 a.m. on August 16, 1916, with a stamp indicating "NORRISTOWN, PA. HOSPITALS." The hospital is still in operation today and is known as Norristown State Hospital. According to its official website, it opened its doors and received its first patient, a woman, on July 12, 1880. By September of that year, there were about 550 patients on site. It was originally called the State Lunatic Hospital at Norristown, according to Wikipedia. I don't know if "State Hospital for Insane," as printed on this postcard, was ever its official title. "Norristown State Hospital was the first of the Pennsylvania state hospitals to construct its buildings in a style following the 'cottage' model, developed in Gheel [sic], Belgium, rather than the large-scale single structure Kirkbride Model3 that was composed of multiple 'wings' attached to it. The Norristown State Hospital buildings were separate structures above ground, but were all inter-connected by a system of tunnels. The 'cottage' model allowed for the separation of patients into areas based somewhat on their level of functioning." Some of the therapy options that were available for the first patients, many of which were occupation-oriented, included a bakery, a billiards room, a carpentry shop, a working farm, a garden, a mattress shop, painting, shoemaking and weaving. Patients could also play croquet and tennis. On the other hand, according to the hospital's website, electroshock therapy, insulin coma therapy, and lobotomies were methods of treatment during the 1930s and 1940s. 1. Floyd County, even now, is sparsely populated, with about 15,000 residents and a population density of about 36 people per square mile. Some of the place names in Floyd County, many of which are unincorporated, include Carthage, Check, Duncan, Haycock, Pizarro, Poff, Smart and Alum Ridge. 2. As a non-historical aside, when I saw that her name was Mary, I thought of the heard-on-tape character of Mary Hobbes in the horror film "Session 9". 3. The "Kirkbride Model," designed by Pennsylvanian Thomas Story Kirkbride, featured large buildings with long, staggered wings that allowed for the most possible privacy, fresh air and sunlight, to benefit patients with mental illness. One of the best examples of the Kirkbride Model was Danvers State Hospital in Massachusetts (most of which has been demolished, with the central shell transformed into apartment buildings). For more on the buildings of the Kirkbride Model, check out the thorough website KirkbrideBuildings.com. 4. In researching this post, I found Papergreat's doppelgänger — a website called Noises in the Attic, which features a post titled "Norristown Asylum for the Criminally Insane: An Early History of Trouble." You have a very fine blog and lovely posts. I saw it for the first time today and am an instant follower of your blog. I have a friend who volunteered there in high school. Mostly, he'd sit and visit with patients. He liked to tell about one gentleman who loved to play chess. My friend, a very good chess player himself, would sit down and the gentleman would ask, "How many moves?" Whatever number my friend gave, that's exactly how many moves the gentleman would take to win the game. Cover of 1872's "The Union Speller"